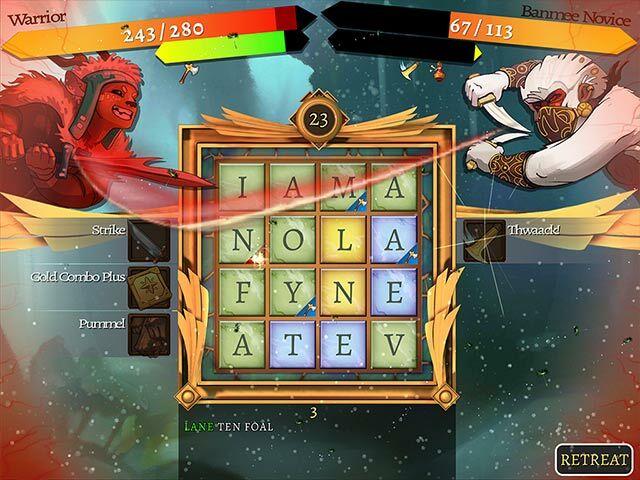 Inspired by a classic word board game, Spellcaster Adventure offers more than 750 million variations for literally endless gameplay. In Spellcaster Adventure the character you play affects the style of word game you play, and the choices you make to grow your character affects every aspect of gameplay. Customize yourself to take advantage at what you're good at, or to make you improve at what you're not. 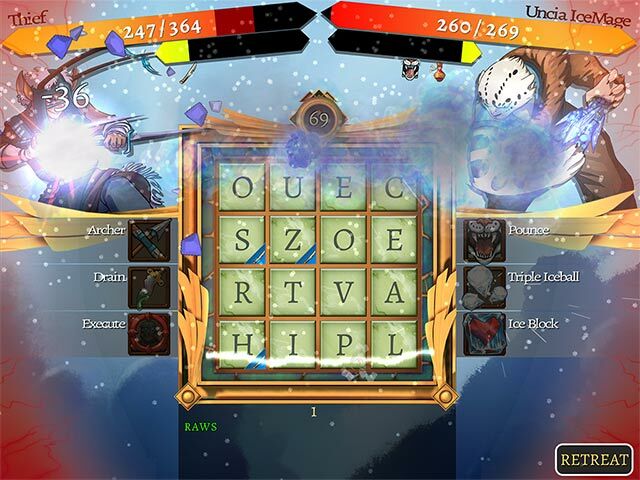 One of very few real-time word puzzle games ever made, we don't pull punches- find and make words as fast as you can, the way the game was meant to be played! Millions of gameplay combinations to stretch your skills! 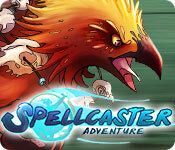 Spellcaster Adventure is rated 3.7 out of 5 by 21. Rated 5 out of 5 by Glitzgoddes from Addicted. Love this game. It is the perfect mix of challenge, word fun, and quick gratifying entertainment in between my day obligations. Rated 5 out of 5 by iturtleman from Interesting and engaging word game I really enjoy solving the Obelisk and rune puzzles! Solving those mind boggling puzzles is extremely satisfying. The campaign starts off pretty reasonably and although I did not like the timer at first, it does not seem to be much of a problem as I got better at it. It took a bit of time for me to realize that I didn't have to be extremely careful but could just try out as many combinations as I wanted as fast as I could. The story bits are extremely entertaining pun-filled quips which provide a nice break between the action. On top of that, the art is beautiful! Rated 5 out of 5 by mafu1178 from Excellent Challenge Big Fish needs more word games like this. The challenge is excellent. Rated 5 out of 5 by Good_life from Great word puzzle game! After playing the demo for about 10 min. I was convinced I liked it enough to want to keep playing so bought the game. I like games that are challenging and requires you to stay focused. This game has that and more. The artwork is really well done and interesting by itself. There is a story to the game, and as you complete each level you are given another page to that story. I found that a great idea because it gives you time to catch your breath as you read it before diving into the next level. If you like word puzzle games you should really try this one, it’s the best one I’ve seen in the market to date. Rated 5 out of 5 by Aleedalee from Great game, love the art and the gameplay! This game does a great job of putting a new spin on the word-making mechanic I've seen in other games such as Wordament. I have had loads of fun making words to fight enemies and level up my character. The RPG aspects of the game make me much more interested in the already fun style of gameplay. The art and music are amazing. I often find myself playing through levels just to see what the new creatures will look like or discover what the new player abilities will be when I level up! Probably easier to learn how to play if you have played other word games. But even if you haven't, the tutorial does a good job of walking the player through the mechanics. The only thing I would love to see in the future is some kind of multiplayer mode. This would be a fun game to play against friends and strangers. I would definitely recommend this game to anyone, especially those who love word games or RPGs. Rated 5 out of 5 by TheDogtoy from Really Fun If you love word games and RPGs this game is for you. Fun characters, story, and gameplay. Challenge matches and boss fights add a whole new twist to the word game genera. Rated 5 out of 5 by mattso81 from Challenging, but fun! Boggle + PuzzleQuest This is possibly the best boggle like game I've ever played, and it's a lot like PuzzleQuest so I imagine i'll find the right rhythm as I level up. It can be difficult to try and watch the battle at the same time as making words, but you kinda get the hang of it. As others mentioned, it's an intense game, but I really like the change of pace from all the other word games out there. The art is really pretty, the story seems well written (though I haven't been able to unlock much of it yet in the demo), and I'm surely a little intimidated! But I'm excited to see what all the modes are about. I hope Big fish does some more word games! 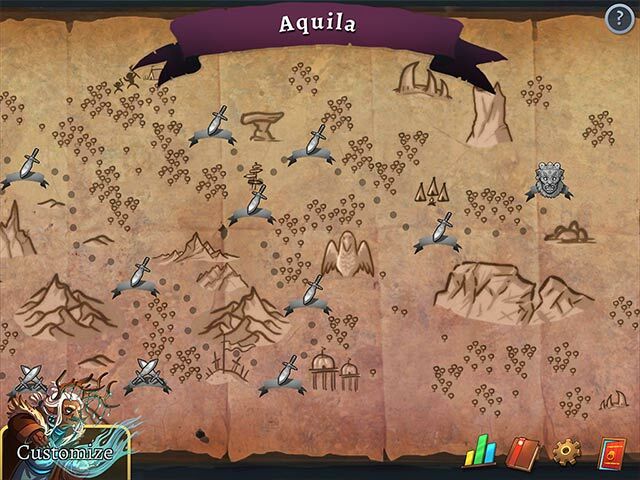 A puzzle fantasy, inspired by the classic word search game.